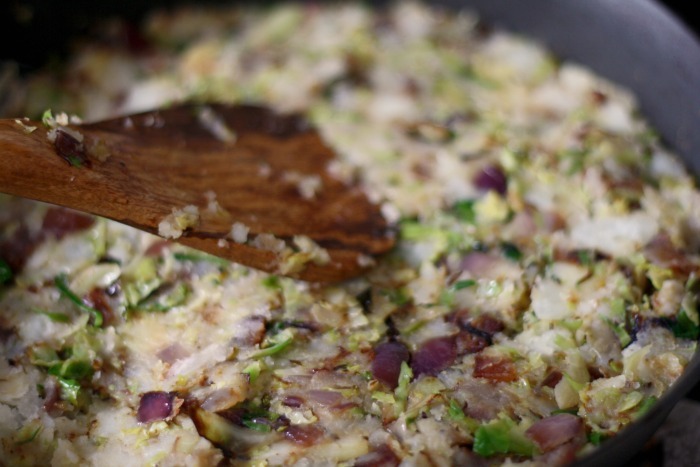 Traditionally Bubble and Squeak is made using the leftover vegetables from a roast. Often times the meat is cut into bits and fried up with the veg, others times, it's served alongside. If you don't happen to have any leftover veggies from a roast, you can still enjoy a wedge of this hearty comfort food by starting from scratch. Although I used brussels sprouts, you could use shredded cabbage if that's what you had on hand. If you have leftover mashed potatoes, feel free to use those in place of the plain boiled potatoes. 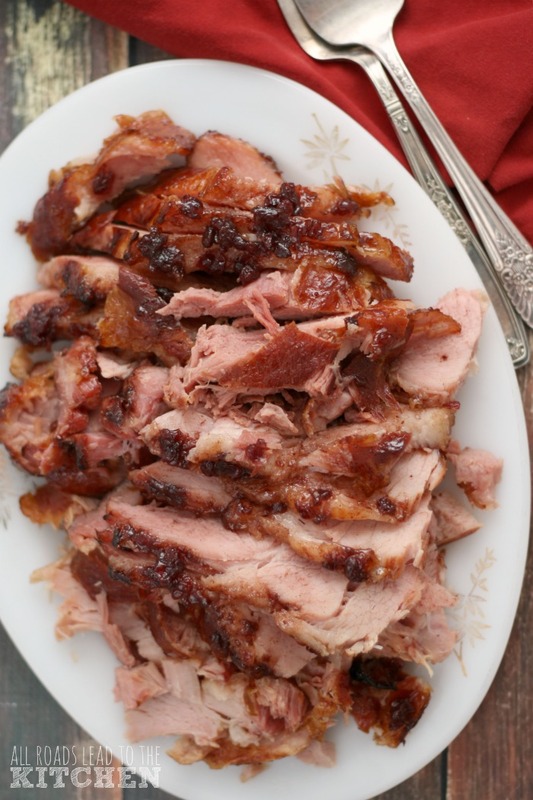 You might wonder why I used duck fat AND pork in this recipe. The simple reason is because I had both and wanted to use both up. Duck fat adds excellent flavor, but you can definitely substitute extra bacon grease or butter if you don't have any hanging out in your fridge like I do. Another thing that may seem a bit out of the ordinary is the addition of pork jowl. 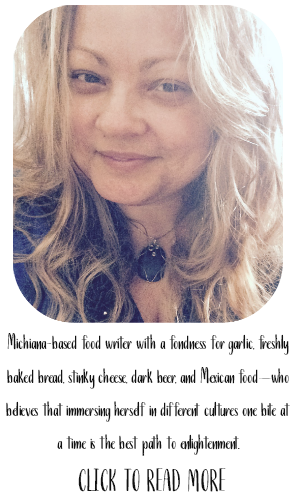 The story here is that I saw a couple at the market the other day...and couldn't resist. 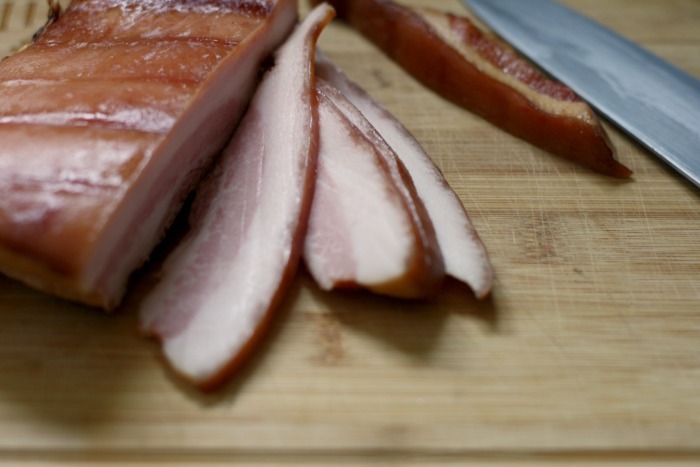 I love smoked jowl, and it's very interchangeable with bacon. The jowl has a bit more tooth to it, lending nice meaty chunks to the veg. 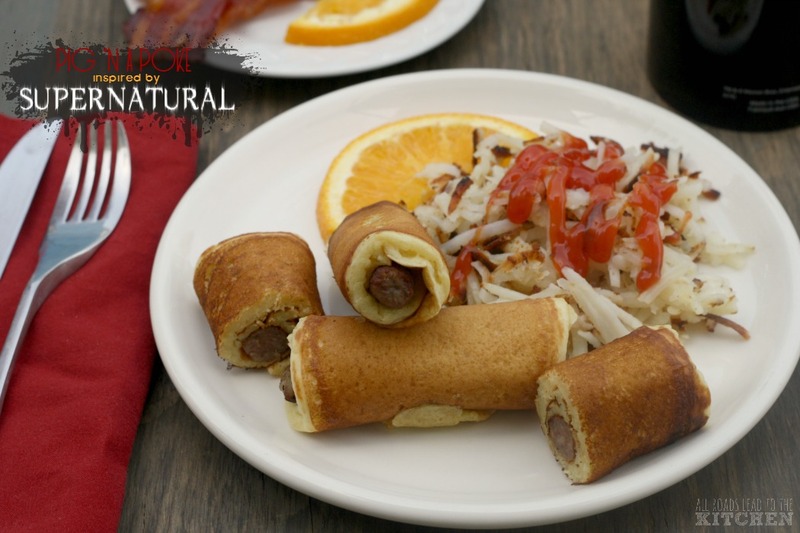 Feel free to substitute thick-cut or double thick-cut bacon, just watch the cooking time and proceed with the recipe once it is golden and has rendered its fat. Serve alongside a roast (just cooked or left over) as a side, or fry up an egg over-easy to serve on top of it. 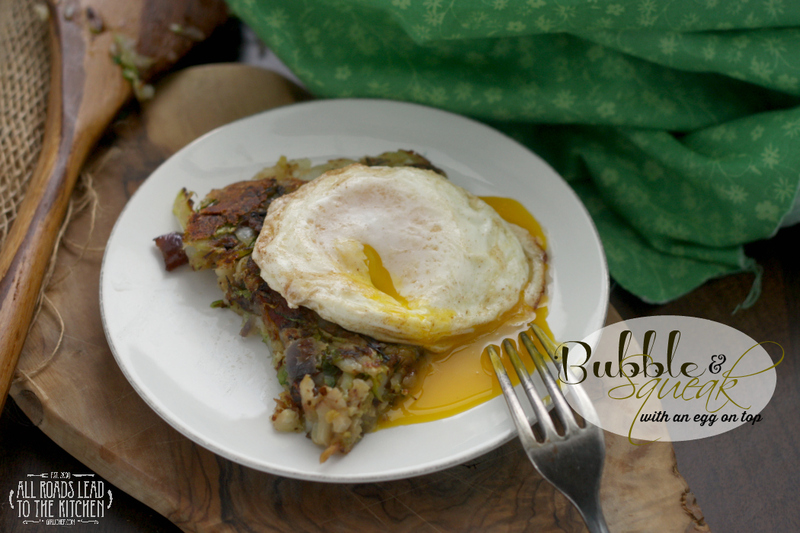 Setting that golden yolk free and mopping it up with the Bubble and Squeak is something every one should experience at least once in their lifetime. 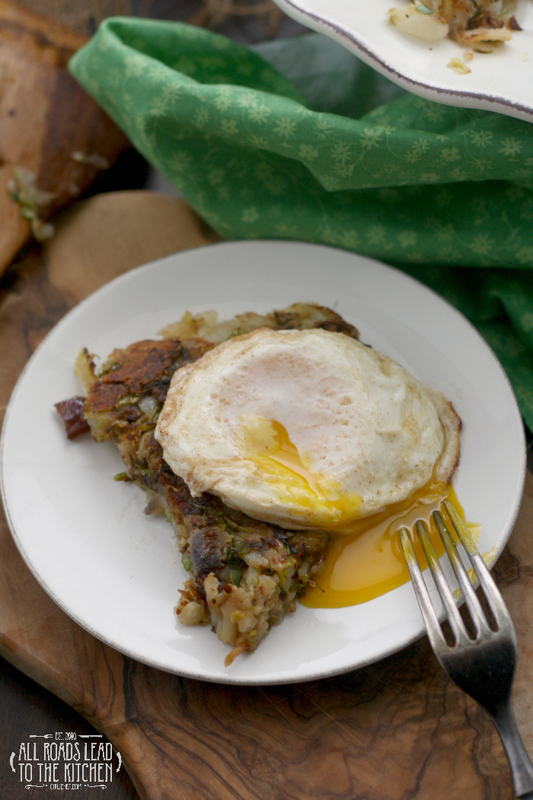 Though traditionally a way to use up leftover mash, meat and veggies, this Irish Bubble & Squeak starts with uncooked ingredients - because sometimes you crave it when you don't have leftovers. Put the duck fat in a large, nonstick skillet over medium heat. Add the jowl and cook until golden all around, about 7 minutes. Just eyeballing it, if you have more than 2 tablespoons of fat in the bottom of your skillet, pour the excess into a small bowl or jar and reserve (in case you need to add more later). Add the onion to the pan and cook until it has started to soften, stirring often (a wooden spoon or rubber spatula works well here), about 5 minutes. 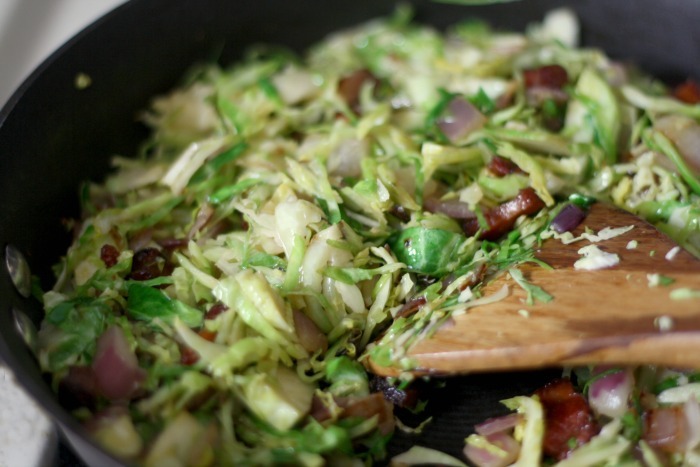 Add the shredded brussels sprouts to the pan and continue to cook, stirring often, until it is soft and tender, about 10 minutes. Add the potatoes to the pan and sprinkle with a smattering of salt and a few good grinds of black pepper. Use a potato masher to mash the potato into everything else, then switch back to your wooden spoon or rubber spatula. Stir everything around it until everything is combined and then push and press it into the pan to form a sort of thick pancake. Lift the edge of the mixture and if the pan looks very dry, drizzle in just a bit of the reserved fat while you lift the mixture up, letting it get to the bottom of the pan. Continue to cook until you the mixture has turned golden and a bit crisp on the bottom and edges. 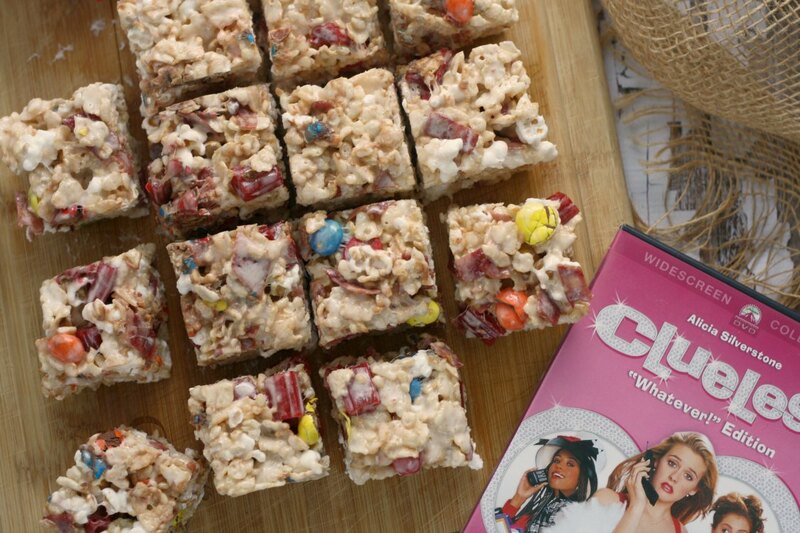 Slide (or flip) mixture onto a serving plate. 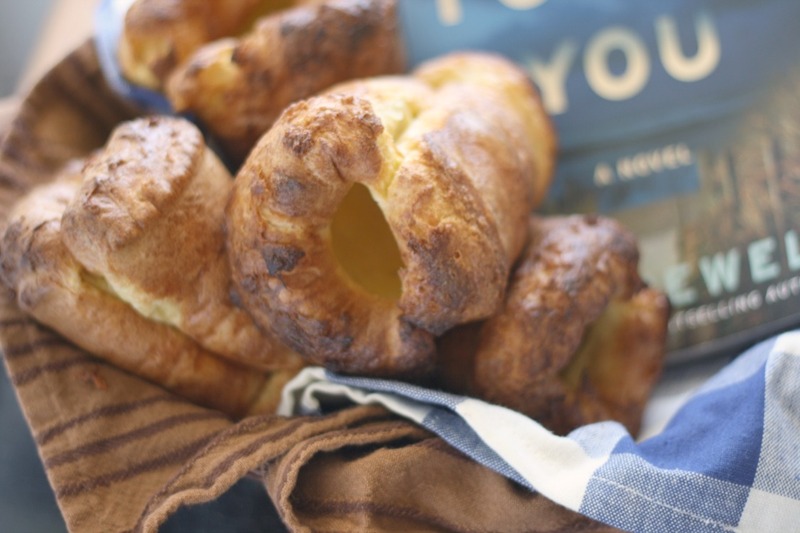 Cut into wedges and serve alongside leftover roast meat or with an over-easy egg on top. 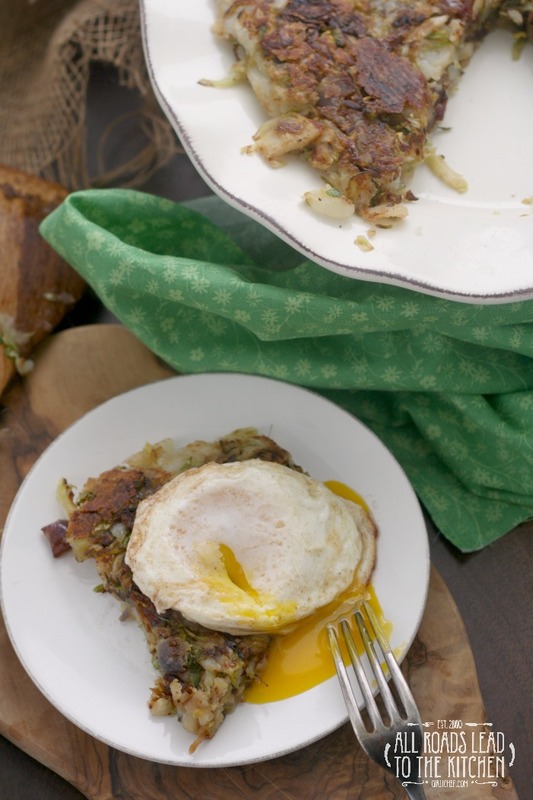 Wondering where the name "Bubble and Squeak" comes from? 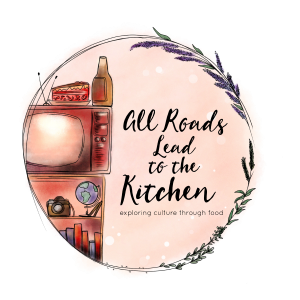 Apparently it has to do with the sound of the meat and veg frying in the pan. 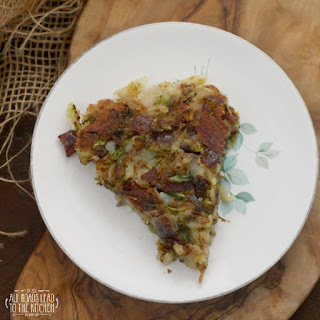 For some really interesting history on Bubble and Squeak, check out the article Mary's Midnight Bubble and Squeak by Food History Jottings.